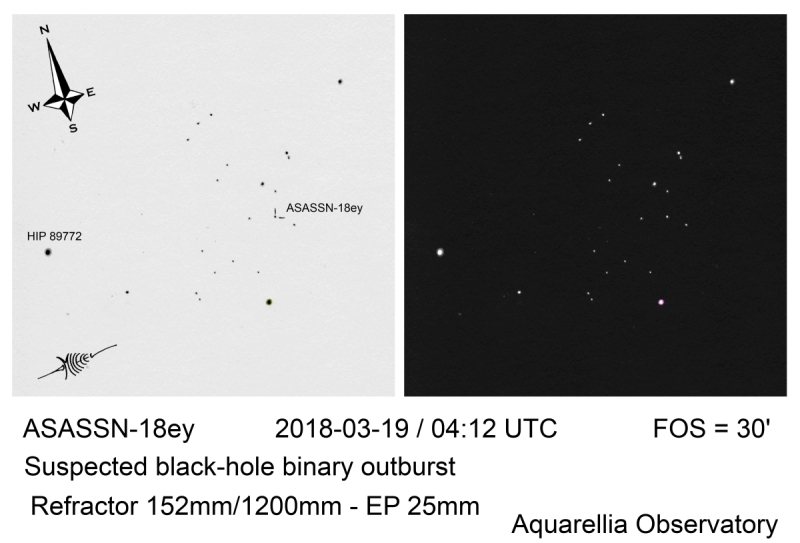 The outbursting black-hole binary ASASSN-18ey (MAXI J1820+070) is currently the subject of a flurry of circulars at The Astronomer's Telegram, but it hasn't received much attention from amateurs. This object shows rapid, aperiodic optical variations on a range of timescales, from milliseconds to several tens of seconds. Even with noise from seeing variations and scintillation, I suspect that amateurs should be able to detect the slower flares, as their amplitude (several tenths of a magnitude) is rather large and the system is bright enough (V = 12.75 on March 16; my measurement) for small telescopes to use short exposure times, particularly if no filter is used. A cadence of < 10 sec per image should be feasible for many amateurs, although at such a fast cadence, it is important to ensure that (1) the computer's clock is accurate and (2) the CCD shutter lag is corrected for. During an outburst, much of the system's accretion disk falls into the black hole. The rapid optical flaring is thought to originate from a relativistic jet, X-ray pulses from the inner disk that are subseqently reprocessed into optical wavelengths, or some combination of the two. Bright optical outbursts in such systems are relatively uncommon. The system's J2000 coordinates are 18 20 21.95, +07 11 07.3. Have you obvserved ASASSN-18ey with V filter? 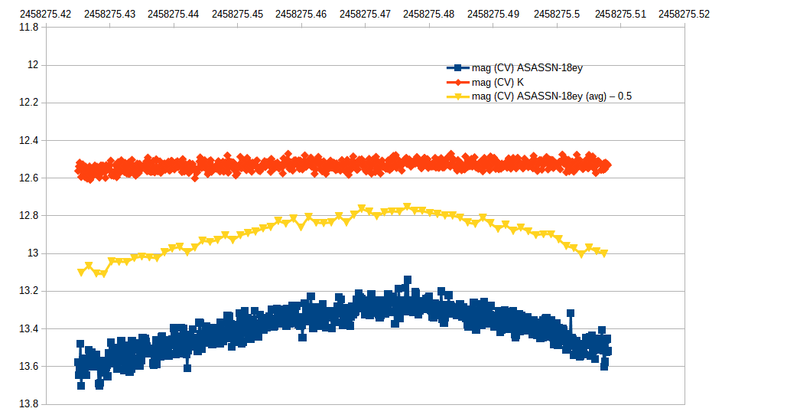 In this case I gonna write you an email, since it seems I've discovered an SR variable only a arcmin from ASASSN-18ey. I will try to get some imaging tonight using 10 sec exposure times using Clear filter. Thank you for this post Colin !!! Maybe of very small scientific value but I estimated this object this morning (2018-03-19 4:12 UTC) +/- +12.3 and as often I did a sketch of the field. Did you think that we could be able to detect visualy some variations or scintillation, if yes I'll have to try again. Clear sky to you all. AAVSO Alert Notice 624 announces a request for observations of ASASSN-18ey = MAXI J1820+070. Please see the notice for details and observing instructions. 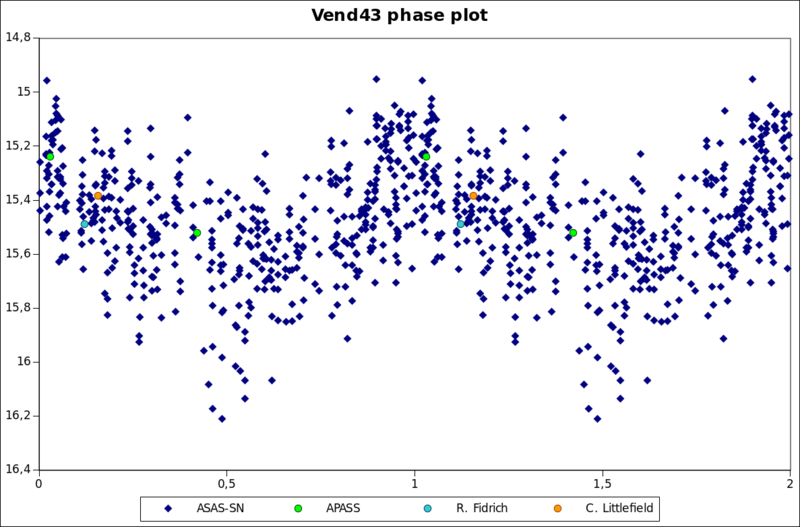 If you observe ASASSN-18ey with V filter, don't forget to do photometry of Vend43 too! Thanx for Colin Littlefield for providing new photometry for Vend43! 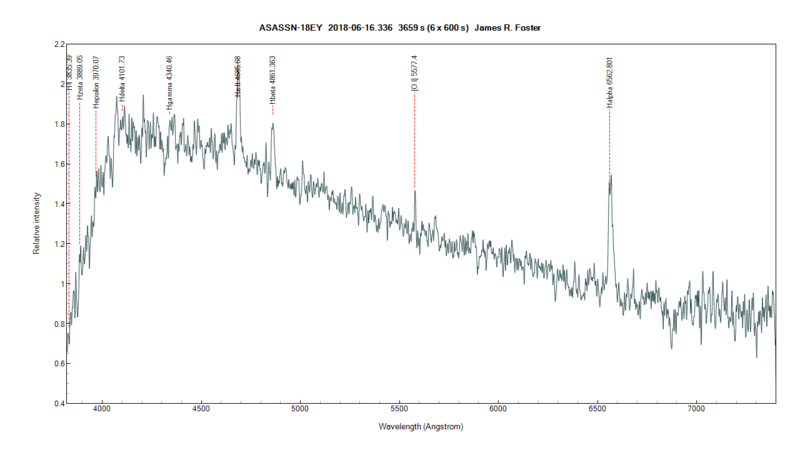 AAVSO Alert Notice 625 announces a multiwavelength campaign beginning TONIGHT on ASASSN-18ey = MAXI J1820+070. Please see the notice for details and observing instructions. I apologize for not getting back to you all sooner. I have been travelling quite a bit lately, all while trying to juggle observations of multiple transients on a variety of multi-wavelength facilities. Black hole X-ray binaries tend to undergo one of two types of outbursts. The first (often called a "canonical outburst") involves a variety of changes in the properties of the disk that feeds the black hole and the jets/winds that can escape before they fall within the black hole's event horizon. The second (often called a "hard-state-only outburst") only involves the "hard" and the "hard-intermediate" accretion states. Each outburst provides different opportunities for studying the connection between accretion inflows and outflows. MAXI J1820+070/ASASSN-18ey (hereafter MAXI J1820+070 to save a few characters) has appeared to have stalled its evolution in the "hard" state. This behaviour tends to occur in "hard-state-only" outbursts. For observers, the stalled behaviour means an extended opportunity to study the "hard" accretion state (which has an analogue with the accretion state of the vast majority of accreting supermassive black holes). While many of our observational programs were hoping to catch that transition from the "hard" state through the "intermediate" states to the "soft" state, we have adapted our plans to this outburst's behaviour. (And to be fair, many observational programs were already designed for the "hard" state). A second implication of the stalled behaviour at its current bright levels is that MAXI J1820+070 may be atypically close for a black hole X-ray binary. I have estimated that the source could be only 1 kpc (3260 light-years) away, which would make it one of the nearest black hole X-ray binaries. This possibility has many of us quite excited; GAIA should provide the distance measurement via parallax soon. I am leading what I like to call a "blitz" campaign on the source. I use this term for a significant multiwavelength campaign focussed on a single day. My collaborators and I have planned this blitz for the night of April 11th. (Again I apologize for the short delay, but putting this together has taken all of my time recently). The campaign is designed to measure both rapid variability features (0.01 - 100 Hz) from X-ray to radio frequencies and the (quasi-)simultaneous broad-band spectral energy distribution. 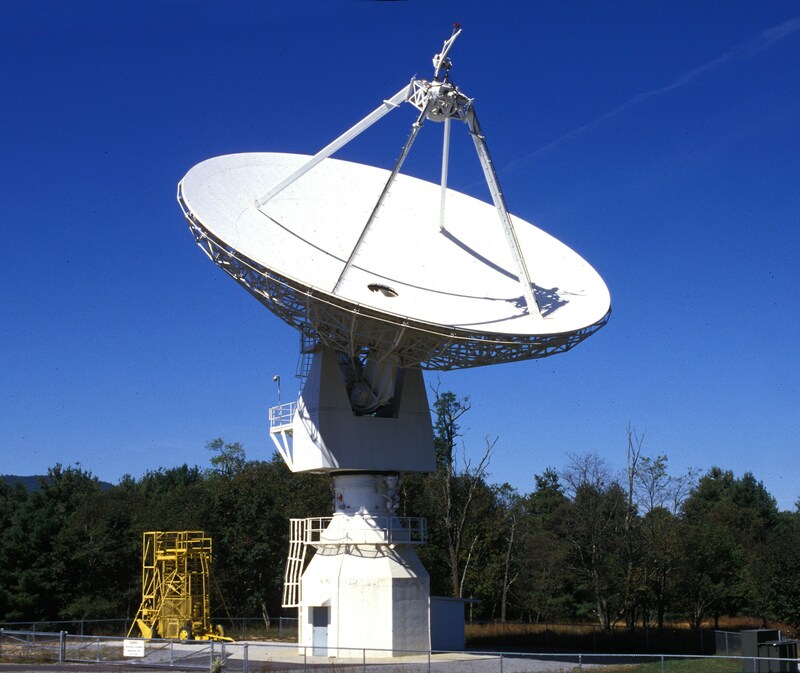 Since the campaign is focusing on facilities that can see MAXI J1820+070 at some time within the window of April 12th 05:00 - 15:00 UTC, we strongly encourage multiwavelength observations (and communication of those observations) within that window. Observations within approximately 24 hours on either side of the window will also be useful for this campaign. I have reports that 1 Hz (1-second exposure) imaging can be done on a 12" telescope with a fairly standard CCD. Although I cannot verify what the readout time or the what type of shutter was used. If you are going to try high cadence observations, be aware that both readout time and your shutter may be a limiting factor. Some detectors are capable of sub-array modes that reduce readout time at the sacrifice of your field of view. I am observing this object since I know about. I have reduced exposure times serval times. From tonight onwards I will try to expose for 2 s in both I and V bands. Data are sent to the AAVSO database. AAVSO initial is HMB. AAVSO Alert Notice 630 announces the campaign by Dr. Greg Sivakoff on ASASSN-18ey taking place tonight and tomorrow. Please see the notice for details and observing instructions, and for important information about the comp star to use for high-cadence time series. While CCD shutter lag can normally be neglected for long exposure times, it becomes increasingly important in short exposures. For example, I measured the shutter lag of my university's CCD to be about 3 seconds, defined as the difference between the actual time at which the shutter opened and the timestamp recorded in the .fits header. This means that the timestamp of each image is three seconds early, which is problematic when observing with 1- or 2-second exposures. I recommend that each ASASSN-18ey observer measure the shutter lag in their camera so that their timestamps are as accurate as possible. I plan to observe this target today using 203/800 and ASI178MM-c CMOS camera with FTP and Time The Sat (GPS application) for precise times. Both show almost the same time, based on my previous attempts with asteroid occultations (<0.1s difference). Such target would require exposure of 0.1-0.2s when CV or 0.5-1.0s with V or R. Because there is almost no delay between frames, do you really need thousands of short cadency measurements or you prefer binned ones (eg. 25x0.2s)? Although I'm not part of this campaign, my advice would be go to as fast as possible while maintaining an adequate SNR. In ATel 11426 (Sako et al.) and ATel 11437 (Gandhi et al. ), there are reports of fast, large-amplitude flaring on timescales of much shorter than one second. In binned observations, these flares would be averaged out, so I suspect that your fastest-possible cadence would be the most useful to Dr. Sivakoff and his colleagues. I just uploaded several hundred observations in BVI and CV do you guys need me to share the subs from Vphot?. Also do we need to observe it tonight April the 13th LAX time into the morning of the 14th?. I used comp star 128 as the check star on all filters except B because 128 was too faint so I used 109 instead for B. Yes, please observe ASASSN-18ey through the night of April 13/14. That will give 24 hours of coverage after the "blitz" window, as Dr. Sivakoff requested, and a little bit more for luck! I guess it's still useful to observe this one, one day it will fall back to its "normal" state and we will want to know whether there were any changes prior to that. I had a nice observing session two nights ago, taking 10 second exposures with an 8" scope in a loop for almost two hours. Well, I guess it's perhaps not useful to upload ca 700 data points for this and instead I should "bin" the measurements. What would be a reasonable cadence given the current state of the object? 10 x 10 seconds or perhaps one every minute would sound reasonable for me to resolve the maximum that I happend to catch during the session with reasonable accuracy, and to help establish any evolution of the variability period? Yes, measurements of this object are still valuable, as it slowly slowly slowly falls back to its quiescent state. I would recommend that with your 8-inch, an exposure time of 30 or 60 seconds might be a good choice. At this point, the object is faint enough that you won't have the signal-to-noise at 10 seconds to catch any flickering variability; and the magnitude of flickering seems to have decreased, in any case. So, increase the exposure time, and keep reporting your results! Thanks for the feedback, I'll bin the data into 60 sec datapoints then. Actually the SNR isn't too bad even for 10 seconds unfiltered exposures thru an 8" scope, but I guess I should switch to V band observations with a longer cadence for the next nights. I have now submitted my measurements and noticed that they fall into a period where we have an almost uninterrupted coverage of the object for nearly 12 hours, from ca 2018/06/05 21:28 to 2018/06/06 09:17 (UT), and almost the entire time interval is covered by two or more observers! All observers are in good agreement, except for a period between 2018/06/06 02:20 and 2018/06/06 02:38 where there is some tension between one observation (in CV) showing a very flat magnitude and another obs (in V) showing a steep decline. I guess I would be more inclinded to believe that both are correct if the narrower filter had the flat light curve. So maybe both observers (BSM and HMB ) might want to double check their data. Otherwise one should get a very reliable averaged lightcurve by just offsetting the individual observers' datapoints with some bias values due to different choices of filters and comparison stars/ensembles. Just from eyeballing this 12 h stretch, I have difficulties seeing evidence for a 3.4 h period linked to an orbital period of the system as suggested in http://www.astronomerstelegram.org/?read=11596 , because that variation should be very regular, right? Has anyone tried to decompose the lightcurve into strictly periodical components and residual oscillations with any success? I had a look at the discrepant data you noticed. In my case the airmass was very high starting with 2.04 at the first image. By removing the first 9 data points then the overlap with the other datasets in the same time rnage is much better. In eclipsing binary star systems, the variation is very regular: the motion of the two stars doesn't change at all (on scales of months to years), and the change in brightness is due to one blocking part of the other. Simple. In this system, most of the light during the outburst is coming from the accretion disk of hot gas which is swirling around the black hole. The brightness of this disk changes over periods of days. There is a variation based on the orbital period, but there can also be variations on other periods, as we see the accretion disk at slightly different angles or positions due to precession of the disk. The net result is that the variations can change in amplitude, and in period. Sometimes they become very small for a day or two. My guess is that this nice 12-hour stretch of data just happened to fall into one of these not-so-variable periods. But the answer will become clear in a few months, when some astronomers (such as Joe Patterson at the Center for Backyard Astrophysics) put together all the measurements from different observers. Keep on collecting that data! Access to a 20 meter Radio Telescope. Any experts willing to help me out? I have access to a 20 Meter Dish in a Radio free zone. Anyone willing to teamviewer and coach me the data collection process. Who would be intrested? The O1 line at 5577A is terlluric. Only notable lines are H-Alpha, H-Beta, & the HeI line aorund 4686A. I wonder if there are plans to take spectra at different phases in the now very pronounced ca 17h period of the light curve. and confirmed in later observations to happen also in X-rays (the discovery of optical rebrightening triggered Neil-Gehrels-SWIFT satellite observations, a nice example of the interplay between amateur and professional astronomers). As mentioned in the related ATELs, followup observations are encouraged. That is one fine instrument! And your location (if it's the one given in your profile) is also quite well suited to observe ASASSN-18ey at this time of year. What is your experience so far in photometry? Or perhaps astrophotography, which is a nice starting point for Variable Star observing? What camera and software are you suing so far? Been in Astrophotoghy over 15+years with over 75 telescopes owned, currenty have a Planewave 24" on a Proline 16803 CCD with a 10 fliter wheel on a 10 Micron 4000 mount. I have done astrophotograhy in the past but really want to put to use this 24" doing reaserch within AAVSO. no expierence on photometry. Im located in Abu Dhabi in the UAE. Maxium DL 6 pro. 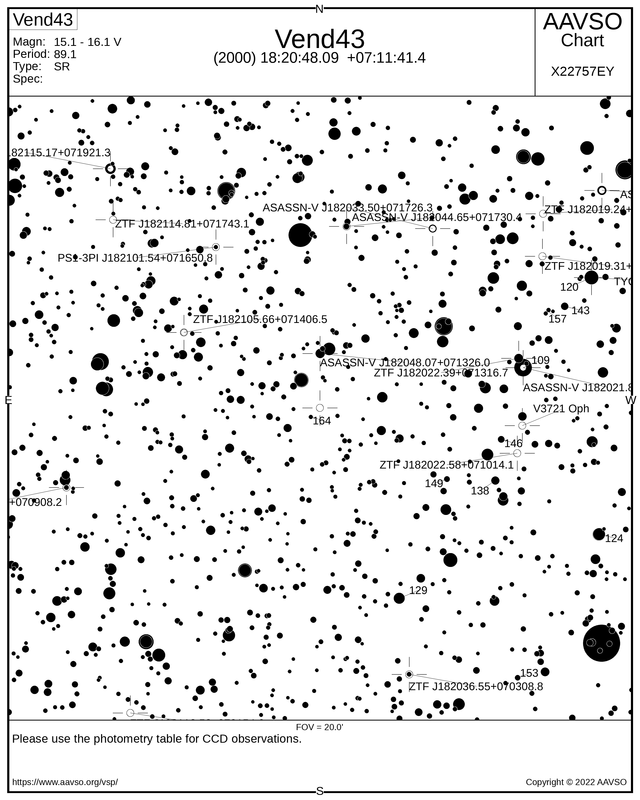 we just did a test run on ASASSN 18ey but now need to learn how to properaly take the image and submitt the data. This is absolutely worth reading, and as you are more than just familiar with astrophotography already you will be able to skip some parts I guess. a) filters: if possible, special photometric filters should be used , in most cases amateurs use the U,B,V,R,I filter set. The V and B filters are the most widely used, and sometimes even photometry without filters is used, but mostly when targets are very faint for a given aperture...not a problem for your setup. For ASASSN-18ey you will want to have a V-filter in your filter wheel. c) a small defocus is actually good. While you want to minimize the FWHM in astrophotography, in stellar photometry it better to avoid having images where too much of a stars light is concentrated in a single pixel, especially with precision tracking. Too much defocus can increase the noise in your measurements, but saturation just ruins the images for photometry completely. d) Being experienced in astrophotography, you will have worked with dark frame and flat field corrections already. This is even more important in photometry, so you generally put a bit more effort and dilligence into preparing dark and flat field calibration images. In astrophotography, you can always correct for imperfections in the calibration frames by later steps in the image processing (e.g. gradient removal etc). With photometry, that is not the case, because the strict rule is that you apply only the calibration corrections to your raw science images , and that it is. There is NO further processing of the images themselves. Acquire Images -> Calibrate Images -> Measure the images with software -> DONE ! e) timestamps matter: When doing photometry at high cadence (and ASASSN-18ey is a target where this makes sense) you want to keep the timestamps of your images as accurate as possible by synchronizing the respective clocks via the Internet or GPS receivers. If you share a raw image and the calibrated version of it we here could have a look if all seem ok, and if so, we can basically go to the next step: taking the mesurements.